The Shawangunk Ridge Trail begins at High Point State Park in New Jersey and runs 71 miles northward along the dramatic Shawangunk Ridge to Mohonk Preserve. 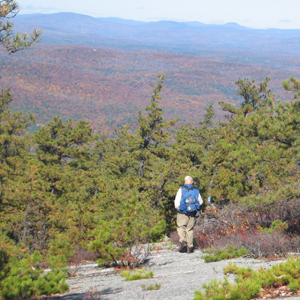 71 miles of the Shawangunk Ridge Trail are maintained by volunteers and member groups. Free, downloadable maps, of the southern gunks. See ad at right and links below. A trail description of the southern half of the The Shawangunk Ridge Trail can be found in The Long Path Guide. The northern half of the The Shawangunk Ridge Trail is shown on the Shawangunks map set. The Shawangunk Ridge Trail (SRT - blue blazes) starts at the Appalachian Trail in High Point State Park in New Jersey and heads north along the southern Shawangunks, then northeast through Sam's Point Preserve, Minnewaska State Park and the Mohonk Preserve in New York. It generally follows the spectacular Shawangunk Ridge, occasionally using local roads and abandoned rail beds. In about 12 miles the Shawangunk Ridge Trail joins the Long Path in the town of Greenville, and it is co-aligned with the LP for the next 34 miles. After crossing Route 211 and going over Gobblers Knob, the trail descends to the Basha Kill Wildlife Management Area. The Basha Kill is an extensive wetland offering many opportunities for bird watching and other wildlife viewing. North of the Basha Kill, the SRT passes through the Village of Wurtsboro and then ascends the Wurtsboro Ridge. The next 10 miles along the ridgetop are among the most spectacular in New York State with the open views of the Catskills looming in the distance, and views all the way back to High Point. Once the trail crosses Route 52, it ascends to Sam's Point Preserve and continues to Verkeerder Kill Falls, Minnewaska State Park and the Mohonk Preserve on its way north and east. The Long Path leaves the SRT in Minnewaska, and the SRT is then co-aligned with existing trails through Minnewaska and Mohonk. The trail is currently blazed to Mountain Rest Road near the main entrance to Mohonk Mountain House, from where one can follow local roads to the Wallkill Valley Rail Trail and the Rosendale Trestle. The SRT was initiated by the Trail Conference in 1989 and continues to be a work in progress. The Trail Conference and its partners work to protect a ridge-length trail corridor and connect the trail to other trails along the way. The Trail Conference is pleased to offer hikers free maps of the SRT via download to your computer. These maps have been fully revised to reflect many minor and some major changes. Four separate maps cover the current existing trail; each prints on an 8.5 x11-inch page. These maps complement the detailed description of the southern SRT found in The Long Path Guide. The SRT also serves as an alternative route on the Long Path for the hiker who wishes to avoid the lowlands of Orange County. Upon reaching the intersection with the Appalachian Trail in Harriman Park, the hiker follows the AT south to High Point State Park in New Jersey, then goes north on the SRT to meet the Long Path in Greenville. I'm also interested in the response to the question on the camping suggests posted by Arcenis? Yep, there is no legal camping in Minnewaska or Mohonk aside from the Witches Hole DEC land by Sam's Point, which is substantially of course. The trail up the High Point Ridge is and down Berrypickers is fun though, so I wouldn't complain about that. The High Point "Road" is pretty boring but more direct. There are plenty of spots that you can get away with camping. I have seen many old campsites out there. If you go into the woods a little bit by Jenny Lane you are unlikely to be bothered unless its hunting season and can probably find an acceptable site. You can also camp legally at the Sameul F Pryor campground by the Vistor Center at Mohonk. It's only a couple/few miles off trail from the Clove Valley Road crossing. Stay on the SRT until you get to Shongum Path a short bit after Clove Valley Rd and take that path (marked red I think) which will connect to Undercliff Carriage Road. Follow that until you hit the East Trapps Connector trail on your right (easy to miss, but there is a small sign I think), which is a very long stone staircase that follows down to the visitor center. Easy to get to the campground from there. Note that the Shawangunk Multiple Use Area is NO LONGER allowing camping as up spring 2016. Use Strava's Route Builder tool to calculate distances for these trails. It's free. We're planning a 4-day backpack end-to-end of the SRT. We'll probably be doing about 15 to 20 miles per day. Our planned timeframe will be this Spring: March-April, 2016. We will be heading north from High Point, NJ to the Mohonk Preserve trail end near New Paltz, NY. We will need to plan this out with anybody interested in hiking this trail with us. For example, we need to plan car parking and other logistics. If you're interested in this backpacking trip, please call Rick & Diann at our phone number 607-217-5775. Shawangunk Ridge Trail Loop w/D&H Possible? What is the northern end of the SRT now? I thought I saw an SRT marker on the old LP in Minnewaska Park heading towards Jenny Lane on Route 44/55. For any one that's planning on hiking the trail. I am a light packer so I take as little water as possible and look for water sources. I use the Steripen. Saturday, August 11 I hiked from High Point NJ to RT 6 and slept on Dec land. Just to let everyone know all the streams that are shown on the map on that stretch are dried out. SRT - LP North Shuttle? Thinking of doing this section from Wurtsboro to Sam's Point this weekend. How are conditions? Crampons required or snowshoes? In 2008, the Trail reopened over Gobbler's Knob. (This updates info in the Long Path Guide.) In Mount Hope a section of 1.3 miles of roadwalking was eliminated by rebuilding the section over Gobbler's Knob, east of Otisville Road. This section had been closed to hikers by private landowners for about 15 years. The Open Space Institute acquired the property, and it will be transferred to DEC. Trail Conference volunteers have reopened the trail. Directions: Going north from Rt. 211 on Otisville Rd, turn right in about 0.3 mi, soon after passing over the railroad tunnel. The trail climbs fairly steeply to a nice lookout point, with views south and west, and then turns north. The trail passes a low escarpment on the right, follows an old woods road for a while, and slowly descends through open woods back to Otisville Rd., about 0.1 mile before it reaches Indian Orchard Rd. Be advised that Indian Orchard road changes to South road when you cross the Deerpark Orange county / Mamakating Sullivan county line. I just noticed that the map of the southern part of the Shawangunk Ridge Trail has a spelling error. The park outside Port Jervis is Elks - Brox Park not Elks - Bronx Park. Thanks for bringing this error to our attention. Soon after we produced this map, I created a map detailing trails in and around Port Jervis and noticed this spelling error, so it has been noted for when we make revisions to these maps.